When the Unitarian Universalist Association moved to a new single headquarter space in Boston, Goody Clancy created several exercises with the staff to understand values, aspirations, and practical needs for the space. Here, staff move blocks around the site plan to identify best fit and relationship. A collage exercise identified collaborative spaces as key, along with spots to recharge. There are the clients that we dream about—with signature push-the-envelope green projects and a flexible budget to suit—and then there are the clients that architects like Z Smith, AIA, principal at Eskew+Dumez+Ripple (EDR), see in real life. In the latter category, Smith says that limitations create opportunities. The Children’s Hospital Ambulatory Care facility in New Orleans was faced with a retrofit-or-build-new decision on a 60,000 ft2 facility spread over three dated 1960s buildings. The operations officials at the Children’s Hospital were driven by the desire to funnel every dime they have into patient care. “Green” wasn’t on their radar. Zoning forced the hospital to work with its existing buildings, but even with that limitation, or maybe because of it, the EDR design could easily be mistaken for a green building. Tight floor-to-floor heights forced an efficient HVAC distribution design using dedicated outdoor air systems (DOAS) for ventilation air, in combination with fan-coil units and mini-splits using variable refrigerant flow (VRF) to handle sensible loads. Simulations showed that upgrading both walls and glazing would save $120,000 in equipment costs, largely through reduced air leakage, while saving close to $20,000 per year operationally. Conversations with Smith and other designers reveal a few key lessons for professionals who want to add value to projects on an everyday basis but face everything from clients with tight budgets to those who simply aren’t focused on having a high-performing building to those who break out in hives at the very mention of LEED. The Children’s Hospital Ambulatory Care facility in New Orleans was faced with a retrofit-or-build-new decision on a 60,000 ft2 facility spread over three dated 1960s buildings. The operations officials at the Children’s Hospital were driven by the desire to funnel every dime they have into patient care. “Green” wasn’t on their radar. But savvy designers EBN spoke with don’t begin the conversation with cost. They start out trying to deeply understand what the client values—and then go about meeting those values within the limitations of the project. 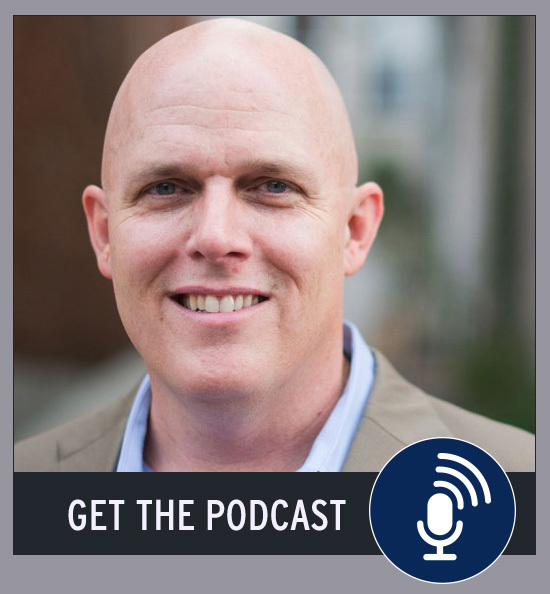 “Learning how to meet people where they’re at and then focus on their interests” has become the lens through which Clark Brockman, AIA, of SERA Architects approaches clients, and he says it’s been transformative for his firm and for making projects more sustainable. Brockman has worked with several projects where the client is a merchant developer who isn’t in it for the long term: they’re developing a project such as a residential tower under a complicated financial structure that might have them flipping the project before it’s even built. Typical green selling points like payback, occupant satisfaction, and even higher rents might not register with them. “Many, if not most financial incentives come to projects after occupancy, which is too late to impact the bottom line for merchant developers,” says Brockman. That money matters isn’t news to anyone, but Brockman says that his firm worked to “understand the way [merchant developers] build their financial model knowing that it’s a time-based issue.” From this, SERA found that if they could demonstrate water savings through modeling, one regional development incentive could be delivered during the permitting process, which fit well with the developer’s bottom line. “We’ve created our own calculators in-house to demonstrate when we can bring different incentives or benefits to the project,” says Brockman. He emphasizes the iterative development process for these calculators—showing them to clients, asking where they fit or don’t fit their reality, and making adjustments. “The more clients we showed it to, the better it got,” he says, to the point where clients stopped poking holes in it and simply said, ‘Wow, this is really helpful.’” Brockman notes that SERA put a chunk of non-billable time into that, but the firm has developed it into a market differentiator. Steven Isaacs, P.E., Assoc. AIA, author of the book Negotiate With Confidence: Field-tested Ways to Get the Value You Deserve, offered EBN the following as his top three tips for designers negotiating with clients and understanding their interests. That perspective is echoed by Jean Carroon, FAIA, of Goody Clancy, who says, “Design is all about dialogue and testing and going back and forth and drawing out more information” from clients. Carroon was recently meeting with the Brooks School in Weston, Massachusetts, showing them drawings for a dance studio. “In the course of conversation, you draw things that they forget or didn’t think were important.” The design team had thought of the dance studios as being open and transparent—with plenty of views and daylighting, per Green Building 101. But in meeting with the client, “We started talking about the shyness of high school students when they are starting to work through dance.” The drawings began shifting dramatically to offering daylighting with views out but not in. 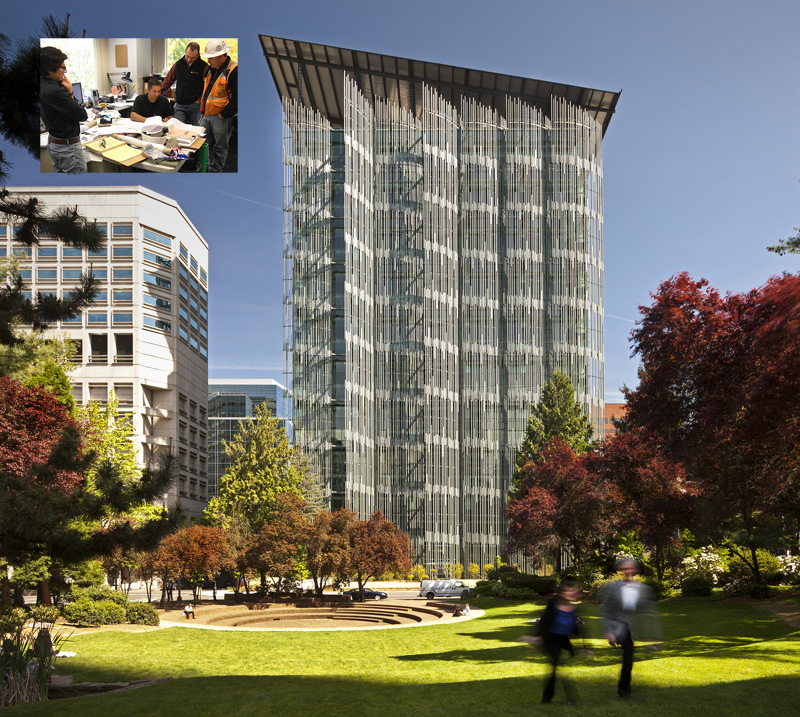 Understanding what really matters to the client (inset) is a mantra for firms including SERA Architects, which led the Edith Green Wendell Wyatt Federal Building project to modernize office space for the federal General Services Administration. 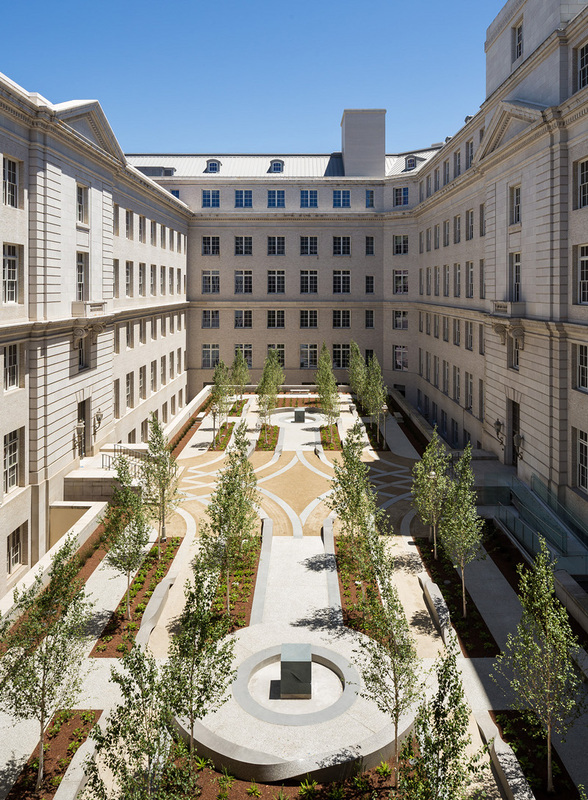 A healthy workplace and cost-effectiveness, which led to a decision to vacate during construction, were among GSA’s priorities. Critical of the ‘draw first, ask questions later’ approach that is common in design, Hosey says, “How can you design things when you don’t know what you’re designing towards?” Hosey wants to understand what matters to clients so that green designers don’t make the mistake of going in talking about energy and water, only to learn that a client views those strategies as nonstarters. That doesn’t imply that sustainable solutions shouldn’t be pursued; to the contrary, it requires teams to dig deeper to understand the connections between different design strategies and find ways to add value—just what designers are paid to do. Projects focused on saving money end up getting rid of things through value-engineering exercises, says Hosey, but as designers often complain, “presumably the things you got rid of were there for a reason.” A smarter approach is to eliminate expensive resources like mechanical systems while relying on free resources like daylighting and outdoor air. “So the client wanted to save money; passive design will help you do that both in first cost and operating cost, with the additional benefit of conserving resources. Those same strategies can help well-being,” and in starting from one value while looking for connections to others, you’ve made good on the client’s needs while adding value through good design. Putting this into practice with a large corporate client with more than 100,000 employees globally, RTKL was tasked with reducing the company’s real estate footprint by 10% to reduce operating costs. “We took their typical space and just by being a little smarter on how to arrange it, we got to 15% or 20%,” says Hosey. “We could have stopped there,” he says, but the team kept going, exploring hoteling strategies, benches, low partitions, and shared countertops, and reached a best-case scenario of 35% space savings. By using smart design, “you’ve suddenly made it easier to move light and air around, created unimpeded views to the outdoors, and created a much more productive space”—all without uttering the word “green.” And a design solution that started as a way to chip away at the roughly 10% of operating expenses directly related to facilities gradually became a way to improve employee productivity in a company where 90% of costs are related to human resources. Of course, not everyone is a reluctant partner on sustainability. Plenty of projects want green features, but “I don’t think anybody has the committed client who doesn't have a budget,” says Z Smith of EDR. Smith relates the story (from when he was with Busby Perkins + Will) of the Center for Interactive Research on Sustainability (CIRS) at the University of British Columbia. Known for its heavy-timber structure in pursuit of targeted net-positive embodied carbon (see Whole-Building Life-Cycle Assessment: Taking the Measure of a Green Building), Smith says that a rigid project budget helped drive that defining design choice. 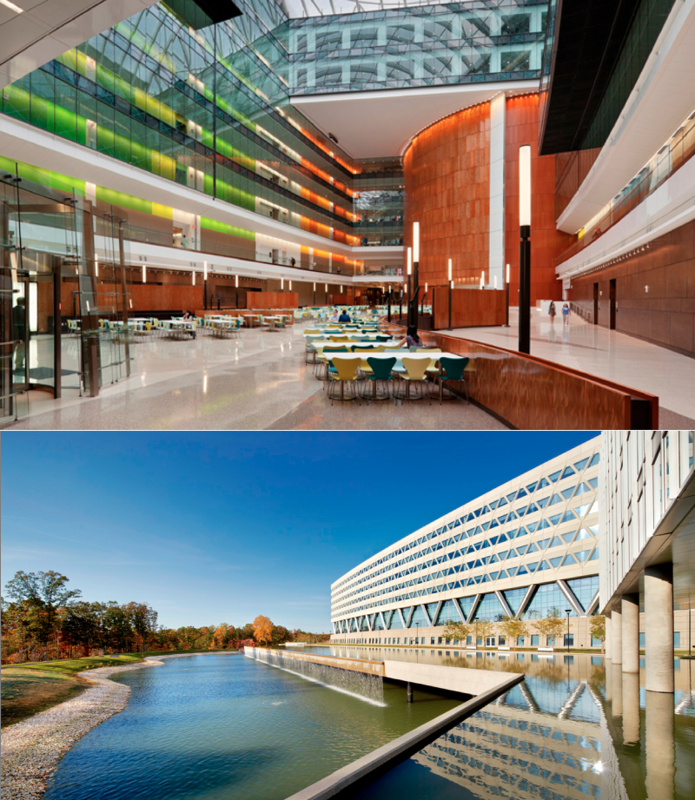 RTKL helped save $300 million over the original budget for the largest federal LEED Gold building to date, the National Geospatial-Intelligence Agency headquarters. 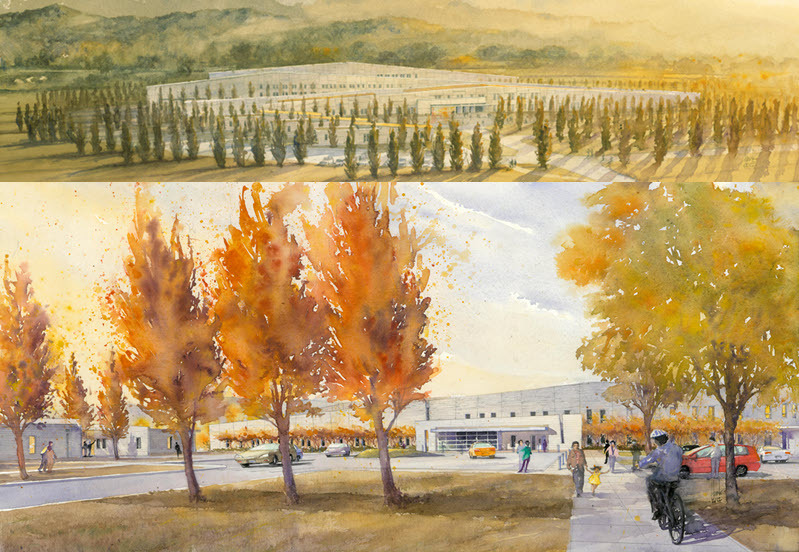 A closely integrated design and delivery process was largely responsible, including a two-tiered retention basin that captures 100% of rainwater onsite and uses it for irrigation and for cooling, while also satisfying the agency’s security needs by keeping vehicles away from the building. This approach didn’t pass muster for the project’s Living Building Challenge bid because the International Living Future Institute didn’t approve of the carbon-based source of the heat, but the strategy helped meet the project goals and budget. The New Orleans BioInnovation Center (NOBIC) had a unique circumstance allowing them wiggle room in a budget—but return on investment was at the forefront. 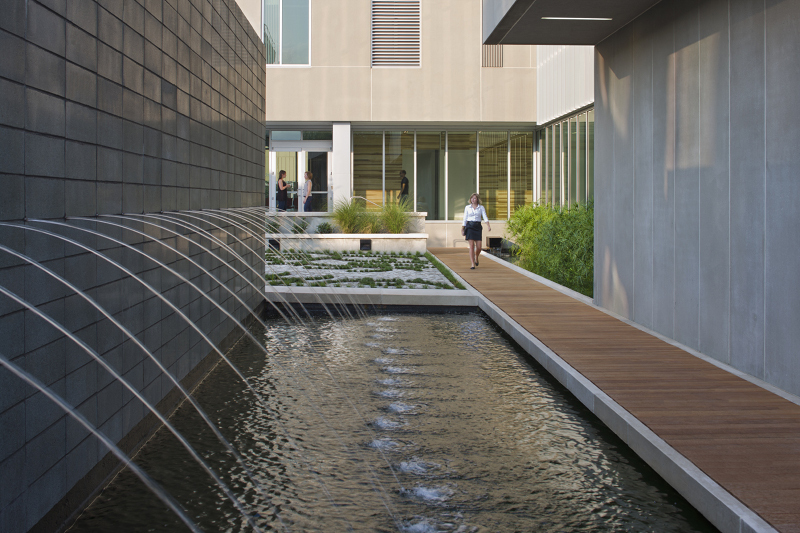 When the New Orleans BioInnovation Center asked Eskew+Dumez+Ripple to add green features that provide return on investment, one that made the cut was a decorative water feature that also provides capture and storage for irrigation, while helping provide the least-flood-prone parking area on the block. “We research our clients pretty thoroughly,” says Mara Baum, AIA, healthcare sustainable design leader at HOK. “We really want to know what makes them tick.” During the design of a 150,000 ft2 mental health facility in Salem, Oregon, Baum says HOK learned that the main focus of the facilities team was running a good hospital, which is difficult enough: they “have a lot on their mind,” she notes. HOK translated that client value into a low-maintenance, energy-efficient design that has measured operational energy use intensity (EUI) of 72 btu/ft2—69% below the national average for hospitals and 58% below code. Building on this success, a similar project for the same client in Junction City, Oregon, has a design for even simpler, more efficient mechanical systems with a ground-source heat pump as the centerpiece, a low-maintenance system that allowed them to do away with much of the central utility plant. “The facility manager was initially skeptical” because he hadn’t experienced this kind of system, according to Baum, but a visit to a similar facility nearby won him over. So did the fact that the hospital, which would normally have to have a primary and a backup fuel source, could get rid of both conventional systems, since the geo-exchange system it put in place was simply extracting heat from the Earth. According to Baum, the system has a “net first cost of zero—and is simpler to operate.” Based on what they’ve seen at the Salem facility, Baum says this system could use as little as 55 Btu/ft2. According to Brockman, listening to clients doesn’t have to limit the options you pursue under the banner of sustainability; it can clarify which ones are more important and help you focus your efforts as a designer. Brockman referred to SERA’s work with a corporate client that is very concerned with the health impacts of materials and creating a healthy workplace. “It’s removed the ambiguity around the tension between indoor air quality and energy efficiency, which is built into LEED and other energy efficiency standards,” says Brockman. Do you increase ventilation rates and filtration at the expense of energy? He says his firm can listen to the client’s priorities and translate them to design priorities. In this case—and as a broader example of what is happening in the industry—“the health of occupants and employees should transcend marginal energy savings,” says Brockman. Another bottom-line-driven business is retail, and here again, Hosey says that a focus on client values feeding into performance-driven design pays off on multiple fronts. Sales are king in retail, and RTKL discovered that for every 1% rise in “dwell time”—the amount of time customers spend in stores—there is a greater than 1% increase in sales. “How do you get people to linger? Well, people hang out because it’s a nice place to be. Now you can connect it to design for comfort,” including everything from indoor air quality to daylighting to connection to the outdoors. The sky’s the limit. Hospital staff have a lot on their minds, so HOK's design for the Oregon State Hospital in Junction City focused on a simple mechanical system using a ground-source heat pump that vastly simplified the physical plant while reducing energy use intensity. Multifamily housing is another sector notorious for being bottom-line driven, with developers passing costs on to tenants. But in one instance, RTKL focused on the cost to the developer when tenants move—renovation costs, advertising, vetting potential tenants. RTKL was able to focus on lease renewals as a key financial driver on the project, and “our research shows that if you know one other person in the building where you live, you are 70% more likely to renew your lease; if you know two or three people, you’re 90% more likely.” Hosey asks, “What is it that’s going to help people get to know each other?” One answer they found was that more abundant landscaping contributed to a better sense of community. “The client just wanted to make more money,” says Hosey, but suddenly they’re planting more trees, filtering rainwater, mitigating the urban heat island, and bringing on other cascading benefits. Listening to clients doesn’t mean not standing for anything. For one firm she’s worked with, that has meant establishing a 100-point checklist defining what needs to go into an energy simulation. For another, that meant getting more serious about collecting energy data from operational projects and linking the data to projects that had performed early-design-phase energy modeling. When firms that have engaged consciously with a project delivery process like this, Batshalom says that “client surveys are off the charts. They say, ‘There are no B teams; we’re getting quality across the firm.’” She added that clients share that they aren’t pushing projects along; they sense true leadership from firms. At RTKL, Hosey says that designers have to do more than show clients two sets of drawings and asking which one they like better: show them what’s elegant about your design solutions. In other words, give them the expertise they are paying for. “We’re working on a big project in Dubai that has a lot of residential in it, right on the beach,” he says, and RTKL had to work on two design schemes, one of which U-shaped courtyards and was based on a master plan developed before they were involved..
“I really try to understand where people’s passions lie in order to understand how to work with them,” says Kirk Teske, AIA, both chief operations officer and chief sustainability officer for HKS. That said, Teske does bring up sustainability early on in a way that addresses the budget concerns of his clients. First, he talks with clients about payback of sustainability features, though not necessarily in those terms. “If I talk about a 12.5% return” versus an eight-year payback, “I am much more successful”—even though they are mathematically the same. 50 United Nations Plaza in San Francisco is an example of a historic “deep green” retrofit that ultimately earned LEED Platinum. The design team circled back with the client throughout the design process to evaluate whether the best sustainable solution was to salvage what was already there or to replace with newer, more efficient systems and technology. Teske also goes after energy: “They are going to designate a cost budget, and we would like them to be an equal supporter of an energy budget.” By putting it in those terms—Teske also refers to “having the discipline to design to an energy budget,” he pitches it as the common-sense, responsible thing to do. He notes that HKS can supply an EUI target using Target Finder and through examples from internal project data. “And that can lead to other sustainability features,” he adds. Those features, including LEED certification, can contribute to marketing, Teske notes, and though dyed-in-the-wool green builders understand that sustainability goes beyond marketing, storytelling has resonance for a variety of building owners. Teske agrees: “We try to push sustainability but try to be pragmatic so clients can respect us and know we are looking out for their best interests.” He says that HKS has learned when and where strategies make sense and when they don’t—so they won’t push green roofs in arid climates where they won’t be seen, for example. Receive continuing education credit for reading this article. The Green Building Certification Institute (GBCI) has approved this course for 1 CE hour towards the LEED Credential Maintenance Program. The International Living Future Institute (ILFI) has approved this course for 1 LFA hour. Focus on a client’s values to drive sustainability solutions. Define the quality of the work being delivered to underscore shared values. Communicate the potential to dovetail energy- and cost-efficiency measures. 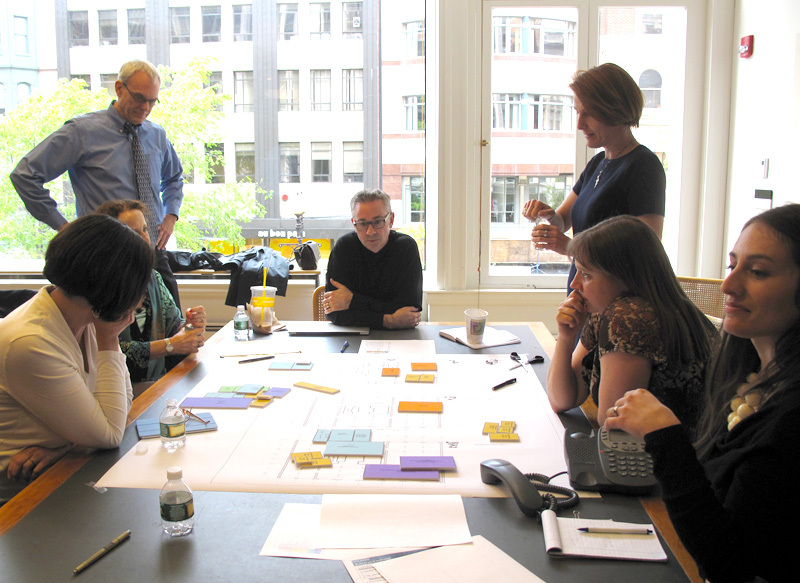 Employ performance-driven design as a strategy to improve the value of the built environment. How does understanding a client’s needs empower a designer? What un-green issues might get your “foot in the door for sustainable design”? What types of incentives or benefits fit well with a merchant developer’s bottom line? Kirk Teske pitches “having the discipline to design to an energy budget” as “the common-sense, responsible thing to do.” What other sustainability issues would you pitch as common sense and how? By understanding and discussing historical context and aspirations with a client, we were able to develop a red-list compliant materials strategy focused on a local, natural materials palette that reflected cultural values, tapped into community knowledge and simplified documentation - satisfying everyone's interests!